Background: Daśamūla (DM) is a top-traded group of medicinal plants used by the Ayurvedic industry. Through literature survey and analysis, this article has enlisted the botanical sources of DM, as correlated by several scholars. Such a list is not available from any single, earlier publication. It brings to light the confusion that exists in terms of botanical sources correlated to Ayurvedic entities. There is quite a bit of difference in the botanical correlation, parts, and substitutes reported in the different scholarly works, particularly for Pṛṣṇiparṇī, and Agnimantha. For e.g., is Uraria picta the original intended Pṛṣṇiparṇī, as the Ayurvedic Formulary of India (AFI) stipulates or is it U. lagopoidiodes or Desmodium gangeticum as other scholars report? While AFI provides two botanical correlations to Agnimantha in its two editions, namely Premna integrifolia and Clerodendrum phlomidis, other scholars correlate it to other Premna and Clerodendrum species. Why has AFI provided stem bark and whole plant as substitutes for roots of DM? Are substitutes recommended by AFI only for ecological or practical convenience or is there an Ayurvedic or pharmacological explanation for the same? Aim: There are many species used in the name of Daśamūla,, in this article all the species are listed out to find the differences in the usage of the drugs. Materials and Methods: Ayurveda texts and lexicons along with the texts which have done correlation work were considered to arrive at a list of various species used as Dasmula. Results and Conclusion: Since neither the methodology nor the logic behind the correlation have been discussed in these scholarly works, including the AFI, the same is not available for analysis or scrutiny. Such a list as provided in this article can form an essential base for a much needed systematic approach at etymological analysis, botanical correlation, and further scientific work to establish legitimacy of substitutes prescribed. Daśamūla literally means 'ten-roots'. The 10 plant drugs of Daśamūla (DM) are grouped as Bṛhatpañcamūla (roots of five tree species) and Laghupañcamūla (roots of five shrubs or herbs). The Bṛhatpañcamūla are Bilva, Agnimantha, Śyonāka, Pāṭalā, and Gaṃbhārī while Laghupañcamūla include Pṛṣṇiparṇī, Śālaparṇī, Bṛhatī, Kaṇṭakāri, and Gokṣura. It is estimated that more than 10,000 M. tonnes of plant raw drugs belonging to DM group is being consumed every year by Indian herbal industry contributing to nearly ~Rs. 500 crore (~USD 1 billion) turnover through the sale of herbal formulations containing this group of medicinal plants. Even though the exact methodology adopted to identify botanical sources for Ayurvedic drugs has not been published, it has been mentioned briefly by Bapalal Vaidya and Balwant Singh and Chunekar that it was done through etymological analysis of drug synonyms as given in classical texts and by interviewing traditional practitioners and Ayurvedic scholars. This required the active engagement of scholarship in Sanskrit, Ayurvedic practice, and plant taxonomy. Several scholars have correlated DM with different botanical entities including some regional variants or substitutes. It is important for the industry as well as researchers to be aware of both the authentic as well as other botanical entities used as equivalents, for two reasons. Firstly, to develop critical pharmacognostic standards to distinguish the former from the latter, for the purpose of quality control and secondly to study the legitimacy of such substitution, i.e. their equivalence in terms of the bioactivities. Proactively identifying legitimate substitutes for authentic but unavailable plant drugs is the need of the hour for the Ayurvedic industry and for that a proper awareness about variation in the usage of different botanical identities is the first step. In order to compile the information available on the botanical sources of Daśamūla group of plant drugs a detailed literature review was carried out on selected classical and current day texts on Ayurveda and trade of plant drugs as provided in [Table 1], including the official Ayurvedic pharmacopoeias published by the Government of India. The basis of selection of these texts is that they are primary references on botanical nomenclature correlation work of Ayurvedic plants and not just a mere report on traded plants and botanical entities. 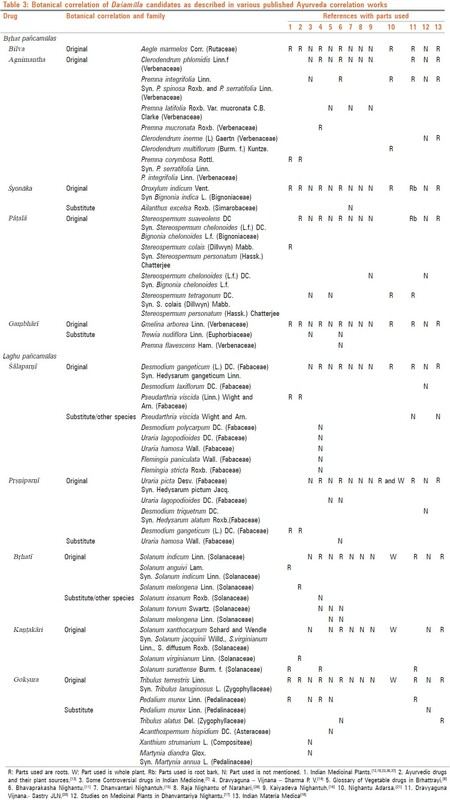 The DM species and their substitutes as mentioned in AFIs have been summarized in [Table 2]. Information from other texts regarding the authentic plant sources, their substitutes and the parts used has been incorporated in [Table 3] ,,. For the current study, the plant species mentioned in the official pharmacopoeias of Ayurveda have been considered as authentic and legitimate substitutes. NB: The period of original Ayurvedic manuscripts [[Table 1]: No 7 and 8] is provided in parenthesis as per the published work “The History of Ayurveda”. The literature analysis indicated that the botanical entities and parts correlated as DM varied between scholarly works [Table 2] and [Table 3]. Confusion has also crept in because some authors have treated taxonomic synonyms of the same plant species as different botanical entities while a few have clubbed different species as one. Many authors have merely correlated the DM herbs to botanical entities but not mentioned the part to be used [Table 3]. This may be because it is implied that Daśamūla refers to roots. We have firstly discussed the findings on the botanical entities and substitutes as provided in three different editions of AFI [Table 2] and in other works [Table 3]. Subsequently we have also discussed the reports on the parts to be used. There is no controversy regarding the botanical correlation of Bilva, Śyonāka, and Gaṃbhārī. All scholars have correlated Aegle marmelos Corr. (Rutaceae) as the source of Bilva, Oroxylum indicum Vent. (Bignoniaceae) as Śyonāka and Gmelina arborea Linn. (Verbenaceae) as Gaṃbhārī. There is no mention of substitute plant source for Bilva by any of the authors [Table 2] and [Table 3]. Bapalal Vaidya has listed Ailanthus excelsa Roxb. as a substitute for Śyonāka. Kolammal mentions Gmelina asiatica Linn. as a substitute for Gaṃbhārī while Trewia nudiflora Linn. (Euphorbiaceae) has been provided as a substitute for Gaṃbhārī by Bapalal Vaidya Chunekar on the other hand has provided both Premna flavescens Ham. (Verbenaceae) as well as Trewia nudiflora Linn. as substitutes for Gaṃbhārī. There is an inherent difference within the three AFIs published with regard to the botanical sources of Agnimantha [Table 2]. The first edition (Part I) mentions Clerodendrum phlomidis Linn.f as the authentic botanical source and Premna integrifolia Linn. as well as Premna mucronata Roxb. as substitutes. However, in the second edition of Part I, Premna integrifolia has been mentioned as the authentic plant source and C. phlomidis as well as P. mucronata are provided as the substitutes. In Part II of the first edition of AFI on the other hand, C. phlomidis. Linn.f. has been listed as the authentic Agnimantha and Premna obtusifolia R. Br as well as Premna mucronata Roxb. are listed as the substitutes [Table 2]. The basis for this variation in listing of botanical sources for Agnimantha is not provided and hence not clear. No substitute species is mentioned for any of the 10 candidates of DM except for Agnimantha in AFI [Table 2]. 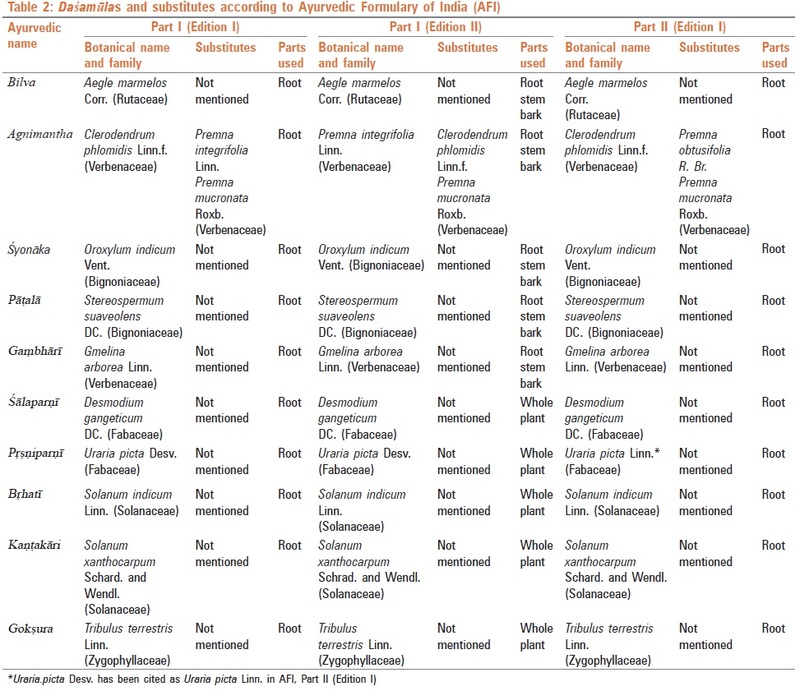 For example in the case of the plant drug Pāṭalā, Stereospermum suaveolens (L.f.) DC., and Stereospermum chelonoides (L.f.) DC of Bignoniaceae are botanical synonyms but have been mentioned as different species by Kamat and Mahajan [Table 3]. Kolammal correlates Stereospermum tetragonum DC. (Syn. Stereospermum chelonoides C.B. Clarke) as Pāṭalā, and Radermachera xylocarpa (Syn. Stereospermum xylocarpum Benth and Hook) as another kind of Pāṭalā called Ghaṇṭāpāṭalā or Kāṣṭhapāṭalā, Warrier correlates Stereospermum colais (Dillwyn) Mabb as Pāṭalā. Stereospermum chelonoides has been considered as Kāṣṭhapāṭalā by Kamat and Mahajan. Similarly some entities that are not synonymous have been clubbed together as synonymous e.g. Stereospermum chelonoides and Stereospermum colais (Dillwyn) Mabb are distinct species but have not been distinguished by Sastry [Table 3]. Stereospermum tetragonum DC. which is actually a botanical synonym of Stereospermum colais (Dillwyn) Mabb, has been listed as another source of Pāṭalā,. The text of Caraka mentions Catasra Parṇī which includes Śālaparṇī and Pṛṣṇiparṇī, They are used together and one is also used in the place of the other in some parts of the country. Both are different plant species belonging to the same family (Fabaceae) as correlated in the API. The controversy regarding Pṛṣṇiparṇī, and Śālaparṇī, is region based. Uraria picta Desv. is the authentic plant source of Pṛṣṇiparṇī, as per API, but U. lagopodioides DC. is also being used by the industry due to unavailability of U. picta in the required volumes. However, AFI recognizes no substitute for Pṛṣṇiparṇī.,, In Kerala, Desmodium gangeticum (L.) DC., which is known as Śālaparṇī, in API, is used as Pṛṣṇiparṇī, while Pseudrathria viscida is used as Śālaparṇī. According to Warrier Pseudrathria viscida is Śālaparṇī, and Desmodium gangeticum is Pṛṣṇiparṇī,, So, in all, there are at least four candidates, namely U. picta Desv., U. lagopodioides DC., D. gangeticum (L.) DC., and P. viscida Wight and Arn that are in use as Pṛṣṇiparṇī. Gokṣura is correlated to Tribulus terrestris Linn. by all the scholars. Pedalium murex Linn. is considered as Bṛhatī Gokṣura (bigger variety) by some authors.,,,, Bapalal Vaidya considers Pedalium murex Linn., Xanthium strumarium L., and Martynia daindra Glox. are the other species used as Gokṣura. The Ayurvedic Pharmacopeias of India (API) dealing with single ingredients have mentioned roots of Bṛhatī pañcamūla and whole plant of Laghu pañcamūla as the plant parts to be used for DM.,,, On the other hand the API on formulations lists the roots or stem bark of Bṛhatī pañcamūla and whole plant of Laghu pañcamūla as parts to be used., API (formulations) in the context of Daśamūla ghṛta has considered has Premna integrifolia as official substitute for Clerodendrum phlomidis and considered stem bark and whole plant as the parts used. In the context of Daśamūlaharītakī Leha root/stem bark and whole plant of the drugs has been taken into consideration. The main question in this regard is that the basis of why stem bark or whole plants have been listed as substitutes for roots is not clear or elaborated in the AFI or API. A few references can also be found regarding substituting with alternative parts of the same plant when the intended parts are not practical to be harvested. For e.g., when flowers of Bilva (Aegle marmelos) are unavailable, use of unripe fruits has been suggested in Bhaiṣajya Ratnāvalī (“Puṣhpābhāve phalaňchāmam viḍbhede bilwatah phalam). There is mention about the use of Śālaparṇī , (Desmodium gangeticum) when Pṛṣṇiparṇī (Uraria picta) is unavailable. However, such references are few and far between, the logic is still not clear and it cannot be extrapolated as a thumb rule to all species. It requires further scientific exploration. Future research needs to focus on not only identifying substitute species but also substitute parts that may be more available, for e.g., stem instead of roots or leaves instead of flowers, etc. While roots are generally the part used in DM, there are a few authors who refer to other parts as well. Sastry mentions root bark as part to be used for both Śyonāka and Pāṭalā [Table 3]. Use of both root and whole plant for Pṛṣṇiparṇī and whole plant of Bṛhatī, Kaṇṭakāri, and Gokṣura has been mentioned by Bapalal Vaidya in Ādarsha Niganṭu. Other than AFI, scholars have not listed stem bark or whole plant as substitutes for roots [Table 3]. AFI does not provide the logic as to how stem bark or whole plant as substitutes. Our work, has, for the first time compiled and analyzed the botanical entities that have been correlated in published texts as sources of one or more of DM group of raw drugs. This has brought to light the fact that there are several species reported as DM candidates other than the ones correlated in the official AFI. Over and above these, it is also an accepted fact that the Ayurvedic industries use several more species as sources of DM raw drugs depending on the geographical region and availability of herbs. There are also issues of authentic correlation of botanical entities, legitimacy of substitution, and controversies regarding parts used as well as taxonomic synonymy that need to be resolved., These can only be resolved through systematic etymological analysis of Ayurvedic terms for each of the Daśamūla candidates and correlation to the accurate botanical entity with the help of competent field botanists, Sanskrit, and Ayurvedic scholars. Such studies need to be published in peer reviewed journals and provided also in the official pharmacopoeias for future reference so that the basis of correlation is clear. It is also important to research and publish the pharmacognostic standards and the comparative bioactivity of original herbs (and parts) alongside substitutes (and parts), so that the sector knows about the legitimacy of substitution. Through a literature analysis of several scholarly works, this article has brought out a list of botanical sources correlated as DM plants. It is clear from the list that there is quite a bit of confusion in terms of the right botanical entity, plant part or substitutes used. It has brought to light issues that need to be resolved in terms of authenticity of correlation of Ayurvedic entities to botanical sources like Pṛṣṇiparṇī, Śālaparëī, and Agnimantha. The need to spell out the logic behind use of substitute parts and species has also been highlighted. Such a list is made available as one publication for the first time. It will be useful for any further work on DM, be it for confirmation of botanical source or for pharmacognostic and pharmacological studies to establish quality standards or legitimacy of substitution. Since DM is a very important plant drug group for the Ayurvedic industry, further Research and Development in the above areas is warranted. Project grant received from the National Medicinal Plants Board, Government of India, is gratefully acknowledged. Our sincere thanks go to Dr. Venugopal, Dr. Ravikumar, and Dr. Subrahmanya for their inputs. 1. Ved DK, Goraya GS. Demand and Supply of Medicinal Plants in India. Dehradun: Bishen Singh Mahendra Pal Singh; 2008. 2. Sastri K. Caraka Samhita. Vol. 1. verse 16. Varanasi: Chaukhambha Sanskrit Sansthan; 1977. p. 28. 3. Sharma PV. Sushruta Samhita. Vol. 1. verse 66-9. Varanasi: Chaukhambha Visvabharati; 1999. p. 364-5. 4. Formulary - Single Drugs, List of single drugs of plant origin. The Ayurvedic Formulary of India. Part 1. 1 st ed. New Delhi: Government of India, Ministry of Health and Family Welfare, Department of Indian Systems of Medicine and Homoeopathy; 1978. p. 241-59. 5. Formulary - Single Drugs, List of single drugs of plant origin. The Ayurvedic Formulary of India. Part 1. 2 nd ed. New Delhi: Government of India, Ministry of Health and Family Welfare Department of Indian Systems of Medicine and Homoeopathy; 2000. p. 307-30. 6. Formulary - Single Drugs, List of single drugs of plant origin. The Ayurvedic Formulary of India. Part 2. 1 st ed. New Delhi: Government of India, Ministry of Health and Family Welfare Department of Indian Systems of Medicine and Homoeopathy; 2000. p. 327-40. 7. Vaidya B. Some Controversial drugs in Indian Medicine. Varanasi: Chaukhambha Orientalia; 2005. 8. Singh TB, Chunekar KC. Glossary of Vegetable drugs in Brhattrayi. Varanasi: Chaukhambha Amarabharati Prakashan; 1999. 9. Varrier KN. History of Ayurveda. Kottakkal: Arya Vaidya Sala; 2005. 10. Kolammal K. Pharmacognosy of Ayurvedic drugs (Kerala). Series 1, Number 2. Trivandrum: The Department of Pharmacognosy; 1978. 11. Chunekar KC. Bhavaprakasha Nighantu, Varanasi: Chaukambha Bharati Academy; 2004. 12. Warrier PK, Nambiar VP, Ramankutty C. Indian Medicinal Plants. Vol. 4. Chennai: Orient Longman; 2003. 13. Sivarajan VV, Balachandran I. Ayurvedic Drugs and their Plant Sources. New Delhi: Oxford and International Book House Publishing Company; 1994. 14. Sharma PV. Dravyaguna-Vijnana. Vol. 2. Varanasi: Chaukhambha Bharati Academy; 2006. 15. Sharma PV. Dhanvantari Nighantuh. Varanasi: Chaukambha Orientalia; 2005. 16. Sharma PV. Kaiyadeva Nighantuh. Varanasi: Chaukambha Orientalia; 1979. 17. Kamat DK, Mahajan SD. Studies on Medicinal Plants in Dhanvantariya Nighantu. Vol. 1. Poona: Indian Drug Research Laboratory; 1972. 18. Nadkarni KM. Indian Materia Medica. Vol. 1. Bombay: Bombay Popular Prakashan; 1976. 19. Warrier PK, Nambiar VP, Ramankutty C. Indian Medicinal Plants. Vol. 5. Chennai: Orient Longman; 2006. 20. Sastry JLN. Dravyaguna Vijnana. Vol. 2. Varanasi: Chaukhambha Orientalia; 2005. 21. Vaidya GB. Nighantu Adarsa. Varanasi: Chaukhambha Bharati Academy; 2005. 22. Sharma PV. Caraka Samhita. Vol. 2, verse 62. Varanasi: Chaukhambha Orientalia; 2001. p. 9. 23. Warrier PK, Nambiar VP, Ramankutty C. Indian Medicinal Plants. Vol. 2. Chennai: Orient Longman; 2006. 24. Monographs.The Ayurvedic Pharmacopoeia of India. Part 1. 1 st ed. Vol. 1. New Delhi: Government of India, Ministry of Health and Family Welfare, Department of Indian Systems of Medicine and Homoeopathy; 2001. p. 36, 38, 59. 25. Monographs. The Ayurvedic Pharmacopoeia of India. Part 1. 1 st ed. Vol. 3. New Delhi: Government of India, Ministry of Health and Family Welfare, Department of Indian Systems of Medicine and Homoeopathy; 2001. p. 3, 29, 147, 178, 209. 26. Monographs. The Ayurvedic Pharmacopoeia of India. Part 1. 1 st ed. Vol. 4. New Delhi: Government of India, Ministry of Health and Family Welfare, Department of Indian Systems of Medicine and Homoeopathy; 2004. p. 99. 27. Monographs. The Ayurvedic Pharmacopoeia of India. Part 1. 1 st ed. Vol. 6. New Delhi: Government of India, Ministry of Health and Family Welfare, Department of Indian Systems of Medicine and Homoeopathy; 2008. p. 26. 28. The Ayurvedic Pharmacopoeia of India (Formulations). Part 2. Vol. 1. New Delhi: Government of India, Ministry of Health and Family Welfare, Department of Indian Systems of Medicine and Homoeopathy; 2007. p. 65. 29. The Ayurvedic Pharmacopoeia of India (Formulations). Part 2. Vol. 2. New Delhi: Government of India, Ministry of Health and Family Welfare, Department of Indian Systems of Medicine and Homoeopathy; 2007. p. 21, 67. 30. Mishra SN, editor. Bhaisajya Ratnavali. verse 23. Varanasi: Chaukhambha Surabharati Prakashan; 2007. p. 71. 31. Shetty M, editor. Yoga Ratnakara. Vol. 1. verse 26. Varanasi: Chowkhamba Sanskrit Series Office; 2005. p. 211-2. 32. Mishra SN, editor. Bhaisajya Ratnavali. verse 12. Varanasi: Chaukhambha Surabharati Prakashan; 2007. p. 71. 33. Shetty M, editor. Yoga Ratnakara. Vol 1. verse 17. Varanasi: Chowkhamba Sanskrit Series Office; 2005. p. 211-2. 34. Venkatasubramanian P. Use of Kshiravidari as a substitute for vidari as per Ayurvedic descriptions. IJTK 2009;8:310-8. 35. Venkatasubramanian P, Kumar SK, Nair VS. Cyperus rotundus, a substitute for Aconitum heterophyllum: Studies on the Ayurvedic concept of Abhava Pratinidhi Dravya (drug substitution). J Ayurveda Integr Med 2010;1:33-9. 36. Warrier PK, Nambiar VP, Ramankutty C. Indian Medicinal Plants. Vol. 1. Chennai: Orient Longman; 2005. 37. Warrier PK, Nambiar VP, Ramankutty C. Indian Medicinal Plants. Vol. 3. Chennai: Orient Longman; 2007. 38. Tripathi I, editor. Raja Nighantu of Narahari. Varanasi: Chowkhamba Krishnadas Academy; 2006.